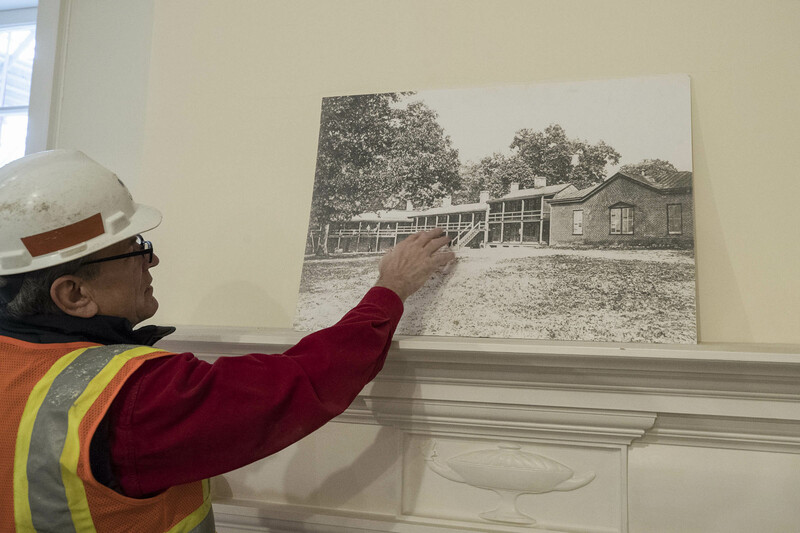 For the first time in more than 100 years, the University of Virginia is renovating Carr’s Hill, a signature historic property that shares architectural DNA with the Rotunda, Old Cabell Hall and other buildings on Grounds that were designed or refurbished by famed architect Stanford White. 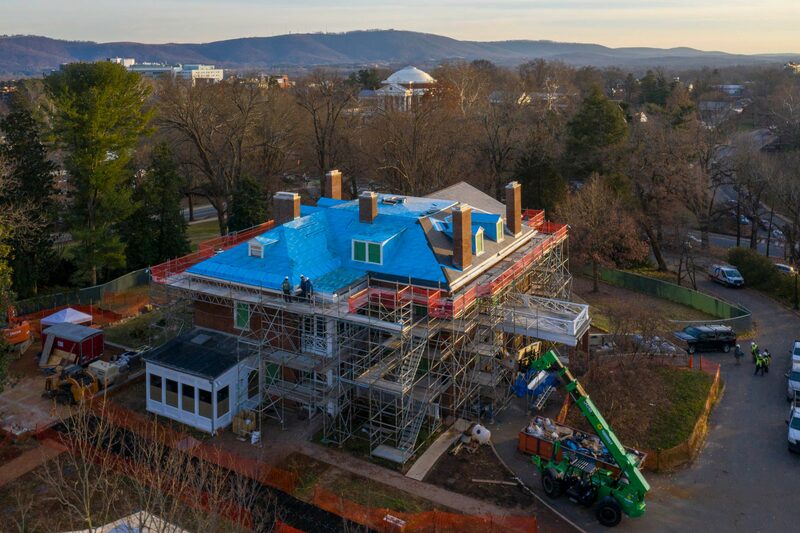 The work on Carr’s Hill will ensure that a property that includes the residence for UVA presidents – and historic adjacent structures that provide office space and a location for gatherings – is appropriately protected as the University begins its third century as one of the nation’s flagship public institutions. Carr’s Hill is listed on the National Register of Historic Places and the Virginia Landmarks Register. The extensive work at Carr’s Hill House, built in 1909, includes installing new mechanical systems, bolstering and replacing the roof, and restoring some of the home’s original features. The project has been in the planning for several years and the University is now able to take advantage of the presidential transition to complete the renovations before President Jim Ryan and his family move into the house. Ryan began his term in August, and is currently living in Pavilion VIII on the Lawn until his family moves from Massachusetts to Charlottesville. The 14,000-square-foot house was initially designed by renowned New York City architect Stanford White, who was brought to Grounds to renovate Thomas Jefferson’s Rotunda after it was heavily damaged in an 1895 fire. White worked closely on the house with Edwin Alderman, the University’s first president, and his wife, Bessie. Initially there was to have been a design contest, but the Aldermans reached out to White, who had also designed Rouss, Cocke, Old Cabell and Garrett halls on Grounds. After White’s death in June 1906, other architects at his firm – McKim, Mead and White – finished the design. Carr’s Hill is the last of the historic White-designed historic properties on Grounds to receive a substantial renovation. Those leading the work say it is not only well-deserved, due to the historic value of the home and its surroundings, but also long overdue. From its founding until Alderman’s arrival in 1904, the University had been managed administratively by the chairman of the faculty, in consultation with the rector of the Board of Visitors. The significant growth of the University at the end of the 19th century made this somewhat informal, part-time administrative structure, which was part of Jefferson’s legacy, impractical for an ambitious, modern university. Alderman, an experienced university president, was brought in to create a new administrative structure for the University. One of those deficiencies is the roof support. In the original design, the weight of the roof was supposed to be borne by the outside walls of the structure, but due to some alterations during construction, the roof weight was also placed on interior walls that were not structurally designed to support the additional weight. This has resulted in uneven floors, some of which sag by up to three inches, and shifting of the building itself. To remedy this, crews are installing two steel trusses in the top floor of the building that will carry the roof weight and place it firmly on the outside walls. 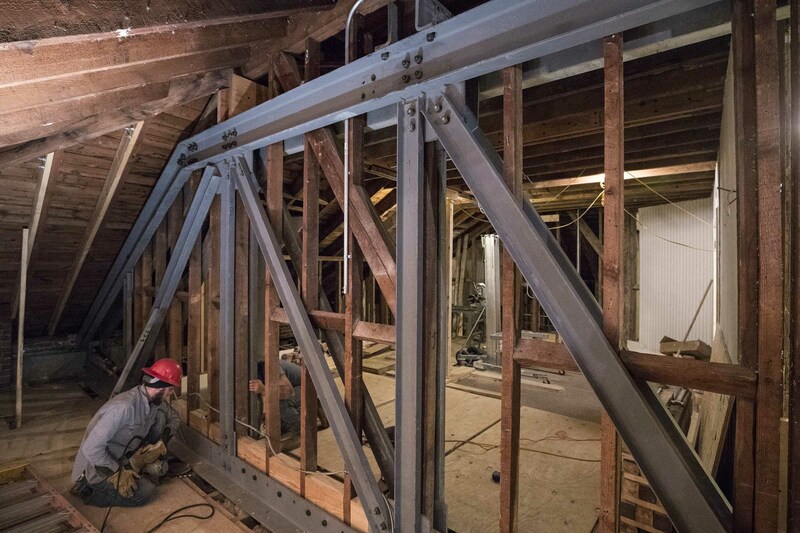 The nine-foot-tall trusses, which span the 57-foot width of the house, are being constructed around the existing wood framing of the original construction. Each truss has nearly 100 steel sections and fittings, all of which must be assembled in place with bolted connections. A smaller truss has been built in the north wing of the house, a combination of engineered wood and steel plates that are laminated together to bear the weight. A renovation of this scope and magnitude is not inexpensive, and there have been some surprise discoveries along the way, which is not uncommon when working on an old house that has not been renovated in a long time. The original estimate for the Carr’s Hill renovation was $7.9 million, which will be funded by institutional funds. When crews inspected the roof, they discovered it needed to be completely replaced rather than simply repaired, which will increase the cost by an additional $2.3 million. That additional cost will be financed through deferred maintenance budgets. 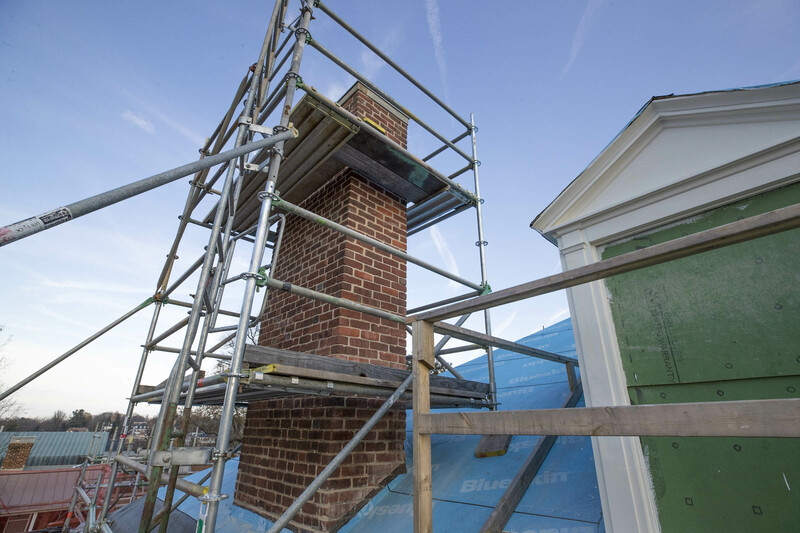 Crews are also replacing the built-in gutters, and the five tall chimneys on the house are being repointed. The necessary mechanical and life safety upgrades include replacing wiring and galvanized pipes and installing fire safety, security and information technology, as well as new heating and air conditioning. Workers are reinforcing the joists that support the main floor by adding a second joist to each and sandwiching the supporting wood girders with steel plates. An existing bathroom underneath the main staircase will be enlarged and redesigned to provide wheelchair accessibility, the first bathroom in any of the Carr’s Hill buildings to be compliant with the federal Americans With Disabilities Act guidelines. The surrounding landscape will also be modified to provide accessibility to the house and the exterior event spaces. While structural and mechanical upgrades are required, the project also necessitates historical restoration of the house. In the original design, pocket doors, which slid into cavities in the wall, separated the central hall from the parlor, the library and the dining room. 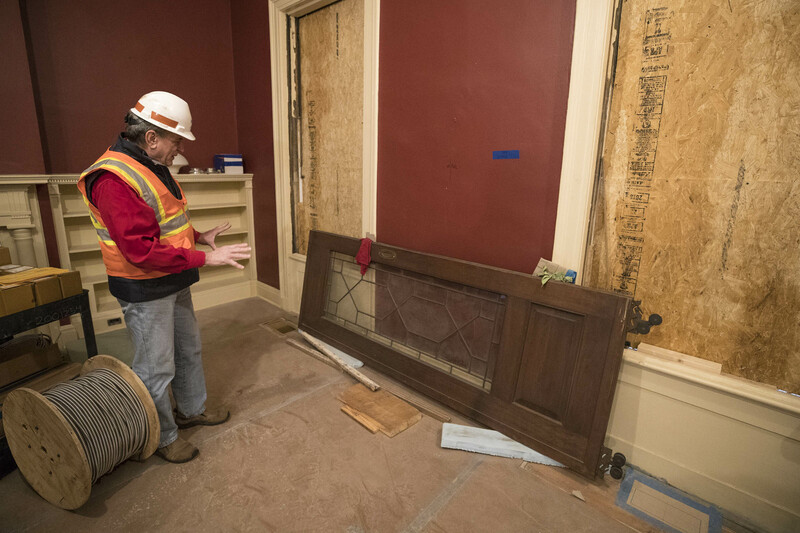 These original walnut doors, with leaded glass panels, have been preserved in storage and they will be returned to their original locations. The leaded glass pattern in the doors matches the design on two glass-front cabinets that had originally been in the dining room. Those cabinets, which had been previously moved upstairs, will be returned to the dining room. The hip roof on the house has a flat portion on the top, in which there is a skylight. That section was enclosed originally by a balustrade, which will be restored. On the grounds surrounding the house, the large brick patio area on the east side of the house will be replaced with a grass terrace. Hogg noted that not only is the house important, but Carr’s Hill itself has had a long history with the University. The property featured student housing on the hill from the 1830s until the beginning of the 20th century, when the president’s house was built. A previous house on the site was built for Arthur Brockenbrough, who oversaw the construction of Jefferson’s Academical Village. After he died in 1832, his wife Lucy remained at the house and operated a boarding facility for students starting in 1833. The property changed hands several times, at one point belonging to Thomas Jefferson Randolph, the University rector and the grandson of the University’s founder. In 1854, Sidney Carr, widow of Dabney S. Carr, purchased the property and also ran a student boarding operation. Carr sold the property to Addison Maupin, and shortly thereafter, the house burned. The University acquired the property in 1867 and it remained a site for student housing through the 1890s. Experts from Rivanna Archaeological Services of Charlottesville found what may be part of the basement floor of the original Brockenbrough/Carr house. Rivanna’s Steve Thompson said archaeologists excavated three holes, 3-feet-by-3-feet at 20-foot intervals, and at the bottom of one they found brick in a herringbone pattern, which he said may be a cellar floor. Thompson said the fill soil above the floor section contained items such as nails that had been subjected to fire, which he said was a further indication that the original Carr house stood there. Thompson said they would have to learn more about it and noted that much of Carr’s Hill was impacted when the current house was built, so most of the archaeological evidence that had been there would have been disturbed and relocated. In addition to its listing on the national and state historic registries, Carr’s Hill is included in the Rugby Avenue Historic District. The design work on the renovation project is being performed by Glavé & Holmes Architecture of Richmond and John G. Waite Associates of Albany, New York, two firms that worked on the Rotunda renovation. Alexander Nicholson Contactors of Charlottesville is performing the work.